A paper ball or small soft ball, clothes and other object for catching ball. To train the upper limb power of children. To train the ball throwing and catching skills of children. To train the hand-eye coordination of children. Parents hold the clothes and their children hold the paper ball. 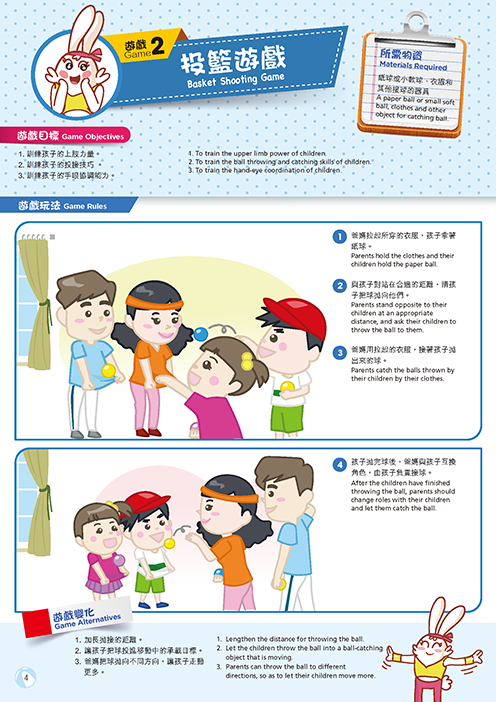 Parents stand opposite to their children at an appropriate distance, and ask their children to throw the ball to them. Parents catch the balls thrown by their children by their clothes. After the children have finished throwing the ball, parents should change roles with their children and let them catch the ball. Lengthen the distance for throwing the ball. Let the children throw the ball into a ball-catching object that is moving. Parents can throw the ball to different directions, so as to let their children move more.